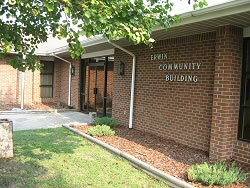 The Town of Erwin offers our Community Center to anyone in town or out of town. Seating capacity is 125 with the ice machine and microwave included. There is an extra charge of $25.00 if using appliances in the kitchen. The Center is available on a first come first serve basis. To reserve the Community Center, please call the Library at 897-5780. The staff will be happy to help find a date that is convenient for you. A contract must be signed by the renter one month before use. The name on the checks for payment must match the individual’s signature renting the building. It is against the Center policy for someone in town to rent the building for someone out of town. Each renter is responsible for the center during use. This includes the center being dirty after your use and damages. The Erwin Community Center is intended primarily for programs sponsored by the Town of Erwin. Other non-profit organizations and individuals may use the room subject to the regulations of this policy. A. Programs sponsored by the Town or jointly sponsored by the Town and other entities have priority over other uses. Certain time periods may be reserved on a regular basis for Town uses and programs. c. Meetings or events held by political parties or interests for the sole purpose of soliciting or raising money. Excluded from this regulation are activities sponsored by the Town of Erwin. Reservations are to be made at Town Hall on a first-come basis. Therefore, reservations should be made as much in advance of the meeting as possible. No group or individual may schedule regular meetings, either on a weekly or monthly basis that could deprive other groups or individuals of the use of the room. No group or individual may schedule more than two meetings per week and may not schedule regular meetings more than two weeks in advance. Exceptions may be granted for educational/training programs presented by an accredited educational institution. Preexisting relationships with appropriate professional organizations may be exempted from this requirement. Meetings are strongly encouraged to be conducted during regular business hours. If necessary, night meetings after regular business hours may also be scheduled upon discretion and approval of the Town of Erwin. The party signing the “Request to use the Town of Erwin Community Center” is responsible for returning the facility to a clean and working order in the fashion it was prior to its use. Responsibilities also include the turning off of all lights, securing all doors and returning the key to the Town of Erwin no later than the following business day. Rental rates for the use of the Community Center shall be set by the Erwin Town Board and may be reviewed and amended from time to time. The current rate schedule is incorporated herein by reference. A key/damage deposit of $ 75.00 shall be required when the Community Center key is picked up from Town Hall. The $ 75.00 shall be required as a deposit to cover the loss of the key, any damages to the Center, and/or provide for clean-up in the event a group or individual fails to clean the facility properly. If the key is lost or not returned, damage occurs, or if the Center is not left in as good a condition as before the meeting, the Town will retain the deposit to help cover expenses and will seek payment for any damages not covered by the deposit. In addition, in the event any group or individual is required to forfeit its key/damage deposit, that group or individual will be suspended from using the Center for a period of one (1) year. No security deposit shall be returned until a satisfactory inspection has been conducted by an employee of the Town. Full payment of the rental amount plus key deposit must be made to Town Hall at the time of reservation. Notice of cancellation of a reserved use of the Community Center must be received at Town Hall no less than two business days prior to the reserved date of use to facilitate a full refund of the rent and key deposits. Failure to comply with this cancellation policy may result in the forfeiture of deposit and rental amount. 3. The use of tobacco products within the Community Center and the use of alcohol on any Town property is strictly prohibited. The Community Center and its kitchen may be used to prepare and serve food and drinks. However, care is to be exercised to avoid spills, stains, and damage which could result in the forfeiture of deposits. The Community Center must be left in good condition. The person signing the “Request to use the Town of Erwin Community Center” is responsible to see that all garbage is removed following the close of a meeting. The Town Manager, or his designee, is authorized to deny anyone the use of the Center if he believes that the party requesting use of the Center would be inappropriate or cause damage to the facility. The Town of Erwin reserves the right to deny use of the Center to any group or individual that violates the law, is disorderly or violates the conditions of this policy. The Town Manager, or his designee, is granted discretion in interpreting these regulations on occasion when applicability of any stated regulation is not clear. Any damage, defects or other problems discovered during the use of the Community Center should be reported to Town Hall as soon as possible. After hour emergencies should be reported via 911 as appropriate. The Town of Erwin is not responsible for any accident, injury, lost or damaged property resulting from the use or occupancy of any Town-owned property. All wedding receptions, parties, showers, reunions, receptions, and other similar events shall be subject to a $ 20.00 per hour fee for the provision of on- site security by the Town of Erwin. The Erwin Town Board of Commissioners reserves the right to waive or amend any portion of this policy as it sees fit. The reservation of dates for use of the Town of Erwin Community Center shall not be made more than sixty (60) calendar days in advance. All required deposits and fees are due at the time that a reservation is made. You can also download a PDF of this policy.